I bought this book as soon as it came out, as it had been my Most Anticipated Picture Books of 2012 list, and because the illustrator was nominated for the Marilyn Baillie Picture Book Award for the adorable Cinnamon Baby, and I wanted to compare these books. We read it right away and loved it. But I didn't review it. I was waiting for a post where I could announce that Spinky had lost his first tooth and I could tie it into this book. But months have passed, almost all the children in his kindergarten class have lost their teeth. And Spinky? Not a wiggle in sight. It's hard being the youngest in your class! Like Spinky, Sophie the dancing mouse is small. But she has pluck, and she has smarts, and she will keep going to the end without giving up. The end, in this case, is a competition to see who can be the new Tooth Mouse, France's version of the Tooth Fairy. Sophie whirls and twirls her way through the competition, coming up with inventive ideas and doing it with integrity. Bravery, honesty, and wisdom are the traits that make her who she is. 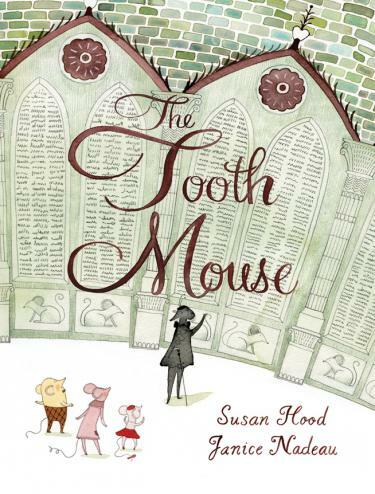 Susan Hood blends French phrases seamlessly with delightful English turns of phrase. Janice Nadeau, who has won three (!) Governor General prizes for Children's Illustration, adds so much detail and tells extra stories in her soft watercolours which provide the perfect timeless French feel. Oh those adorable mouse-sized berets! So why have I finally decided I need to get this out in the blogosphere if my son still has all his teeth? Because I will round up the best picture books of 2012 this week, and this book needs to be on that list! This is the twenty-ninth book I have reviewed for the Sixth Canadian Book Challenge.